Real Food, Really Fast is Hannah’s latest. It’s a robust, vibrant, playful collection of vegan recipes that take 10 minutes or less to prepare and are made with real food ingredients. Hannah’s starting point is that a lot of convenience food is far from wholesome and lacking in the foods—vegetables, whole grains, legumes—that give such rich nutrition to plant-based diets. In place of the usual frozen and boxed fare, she offers up whole food dishes—breakfasts, snacks, soups, salads, sides, entrees, and desserts—that come together in mere minutes. There are some recipes in the book that I expected to be quick, like salads and snacks. Others came as a surprise: 10 minute chili, a black forest skillet crisp, mofongo bowls with plaintains and black beans (the cooking process is sped up by microwaving the plantains), a chickpea mulligatawny, and a smoky, chipotle creamed kale. These are dishes that I’d just assume needed at least 30 minutes to build flavor, but Hannah walks readers through a process that will deliver flavorful results in less time than you’d ever imagine. I’ve sat down and already bookmarked about a dozen of the recipes, including the A+ Benedicts (made with tofu patties), Straight-up Chickpea Scramble, Three Pea Soup, Cruciferous Colcannon, Couscous Biryani, and Walnut Bolognese. I’m so excited to explore, and the book found me at just the right time, as work and school have been a little overwhelming lately. 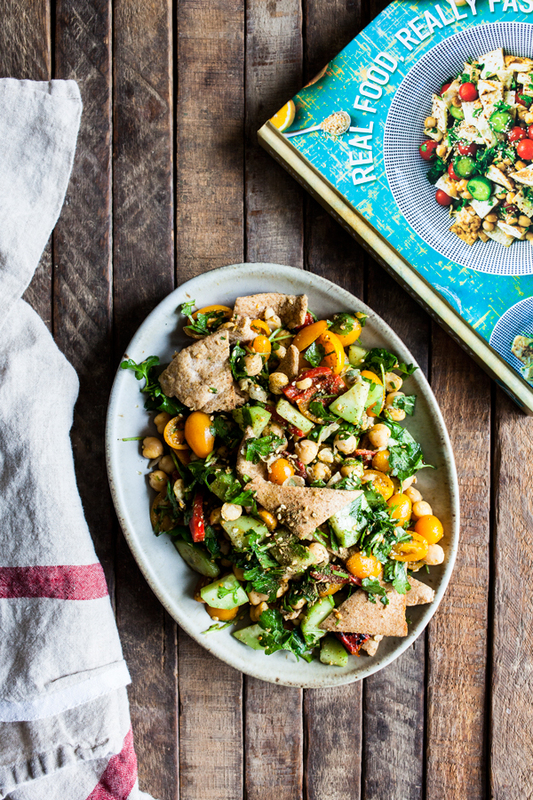 I started off with the recipe that’s pictured on the colorful cover of Real Food, Really Fast: Hannah’s Falafel Fattoush. 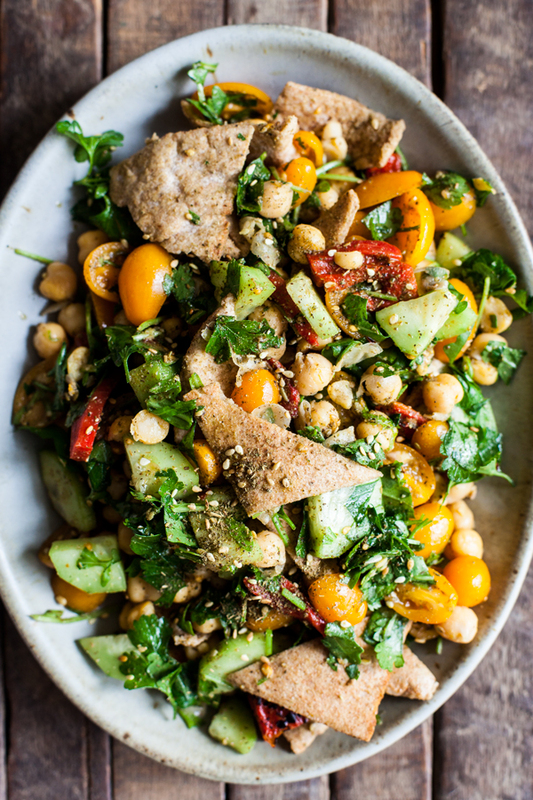 It’s a colorful, crunchy mixture of pita chips, chickpeas, cucumbers, cherry tomatoes, parsley, and spices, and I think it embodies so much of what Hannah’s up to with this book. Folding minced garlic, crushed red pepper, cumin, and coriander directly into the salad ensures that flavor is built quickly. You can use pita chips if you wish, or bake yours; I did neither. I actually put pita halves into my toaster and let them get crispy, then tore them into pieces. It worked perfectly! And chickpeas stand in for traditional falafel her, making this a quickie dish that’s also focused on whole foods. I made a couple of little additions to the recipe: roasted red pepper strips, because I had some that needed to be used, a handful of arugula, and I used za’atar in place of plain sesame seeds. Everything worked. One of the nice things about this book is that it’s pretty accommodating of small swaps and adjustments. If you took falafel but skilled all the mashing, mixing, and deep frying, you’d get the gist of this herbaceous Middle Eastern panzanella, also known as bread salad. Deconstructed dishes get a bad rap in this postmodern culinary scene, but just this once, I wouldn’t take offense at the term. Everything you’d want from a good falafel sandwich can be found in this abundant bowl, simply chopped and tossed for a fresher, more flavorful experience with every forkful. The pita become soggy fairly quickly, so don’t delay after tossing it with the dressing. Dig right in immediately, or withhold the olive oil and lemon juice until you’re ready to serve. Lightly toast the pita bread and chop it into bite-sized squares, about ½-inch each. Place the bread in a large bowl along with the tomatoes, cucumber, chickpeas, scallions, and parsley. Mix the vegetables around lightly to combine. Sprinkle in the minced garlic, red pepper flakes, cumin, coriander, ½ teaspoon salt, and pepper. Toss everything together until the vegetables are well distributed and evenly coated with the spices. Right before serving, drizzle in the lemon juice and olive oil, tossing once more to incorporate. Add more salt to taste, if needed, and finish with a sprinkle of sesame seeds over the top. I loved eating this salad, and in spite of Hannah’s warning that the pita would turn a little soggy, I actually really liked how it all worked together when the pita had sopped up some of the dressing and spices. I served it with some of my simple French lentil soup (this week’s batch cooking), and it was a perfect lunch. At this time of year I tend to start to crave green and crispy things, and the meal satisfied that craving while also giving me plenty of heft. I’m such a fan of what Hannah does, and I’m happy to be sharing a copy of Real Food, Really Fast with one US reader today. You can enter below to win, and I’ll announce the winner in one week. Good luck! And I’ll be sticking with the salad theme (albeit hitting very different notes) with a recipe that I’m sharing next week. Before then, I’ll be checking in with weekend reads. Wishing you all a restful Friday night. Recipe reprinted with permission from Real Food, Really Fast, copyright © 2018 by Hannah Kaminsky. Published by Skyhorse Publishing, New York. The post Falafel Fattoush from Real Food, Really Fast appeared first on The Full Helping.